Classed as the second most venomous land snake in the world and also the most common snake found in South Australia. 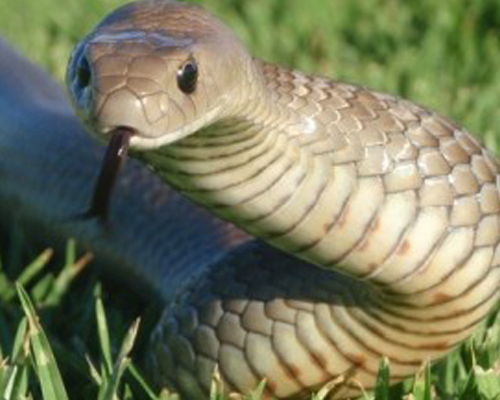 Also known as the common brown snake it has adapted well to our natural environment. It is known to visit many backyard’s in and around Adelaide’s suburbs. You will mainly see snakes from September through to May. They are highly active in the early part of the season whilst out searching for a mate and on the hunt for food, being hungry after coming out from hibernation. The female will lay her eggs generally in a moist warm place around November and leaves them to incubate. She does not stay with her eggs or nurture her young. They are left to hatch and venture into the world on their own, completely independent. She can lay up to 40 eggs at one time and has been known to double clutch in one season. The brown snake comes in over twenty different colour forms from cream to black and orange to olive, generally being a shade of brown. They grow up to 2 meters in length with the average suburban snake being around a metre or so. In appearance they have narrow head and a slim body. Brown snakes like to hide and prefer dry areas. Under rocks and concrete, sheets of tin, woodpiles and logs. They will also use animal holes and burrows; Can find a home in retaining walls, compost areas and farms barns. Rats and mice are a favourite in their diet along with lizards, even the common backyard Blue Tongue lizard and other snakes.